For the first time in my history as a mother, three of my five kids are playing soccer (no soccer mom jokes, please). Instead of entering this phase gradually, we decided to jump in head first since they were all so stinking excited to play. The boys are each on a different soccer team, of course, and as such, we have between 6-8 practices to get to in the evenings Monday through Thursday and a very special dedication of entire Saturdays to soccer games until at least the end of forever (ok, October). I’m trying to be gracious about it all but my hermit tendencies and desire to underschedule instead of overschedule my kids is making this painful. Especially when it comes to dinner time. Maybe I’m crazy (no comment, please) but I’m bound and determined to try and get a healthful, family meal in everyone’s tummies despite the nuttiness of soccer schedules. Enter this meal: it comes together in less than 15 minutes (gotta be prepared with cooked chicken, yo) and better yet, the creamy, flavorful chicken filling can be prepped ahead of time and refrigerated (although I wouldn’t assemble the wraps too far ahead of time, maybe an hour max, in the event they get a little soggy action going on). 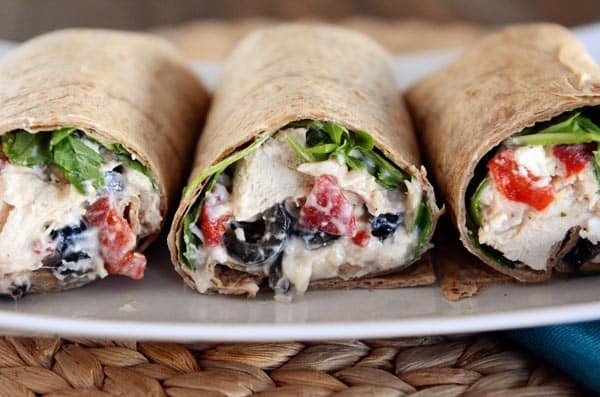 These little wraps are tasty and filling and pretty darn healthy. Keep in mind that the flavors here are fairly bold Mediterranean style so you may want to tone down the Feta cheese or use black olives instead of kalamata and consider spinach instead of spicy arugula if you want a more mild approach. Super adaptable, though. We ate them one night while child A was finishing up soccer practice at which point he collapsed in the shade and I handed him a wrap while ushering child B onto the field and simultaneously shoving a couple chocolate chip cookies in my face (after I finished my own wrap, of course; I’m nothing if not a good example of eat-your-dinner-and-you’ll-get-dessert to my kids). Coping skills. Everyone needs them and the cookie variety does me just fine while I navigate this era of busy boys, sweaty soccer socks, and desperate dinner times. In a large bowl, combine the chicken, feta, yogurt, red peppers, olives, lemon zest, lemon juice, salt and pepper. Divide the arugula (or spinach) among the tortillas, spreading across the entire tortilla. Spoon the chicken mixture down the center of the tortilla (about 1/4 of the mixture for each tortilla if making 4 wraps), and roll up tightly. Use a serrated knife to slice in half. Serve. These tortillas have quite a bit of filling per wrap; I think you could definitely get away with making an extra wrap and putting less filling on each but it's up to you. I made four wraps and cut them all in half - eight halves served our family of 7 eaters perfectly (keeping in mind that a few of my younger kids are pretty small eaters). ﻿PS: a rotisserie chicken, if you have access them at your store(s), works perfectly here, otherwise, this simple method for cooked, shredded chicken is waiting for you. I don’t like the taste of yogurt. What would be a good substitute? You could try sour cream. I made this recipe using baby spinach since I was out of arugala. It needed more Greek yogurt than called for, but it was delicious. I made half the recipe since I am widowed and live alone, but I went through that so quickly I had to make another full batch. I just store in the fridge until ready to eat and then add the baby spinach and the chicken mixture to the tortilla. Yummy!! Thanks for this recipe. Do you think you could turn this into pinwheels instead or do you think they would be too messy to cut? I think if you wrapped the tortilla tightly, it might work! An easily adaptable recipe. I used a low sodium deli turkey and fresh red peppers. I added a clove of garlic to the yogurt and diced up some shallots. Then to assemble, I made the yogurt a condiment (instead of mixing it with the veggies and meat), topped with lettuce, layered in the turkey and put the shallots and red peppers into the center. Then rolled up and served. Thanks for sharing your recipes! Made a slight variation of this today using what on had on hand (spinach tortillas, Mediterranean herb feta and lettuce instead of spinach. Everything else was the same. Delicious. Now I have something yummy to look forward to at lunch time for the next few days! These were delicious. Bigger wraps would have definitely helped though! Thanks for the yummy dinner. We had a little more time on our hands and decided to warm up the ingredients to make a hot wrap. It was awesome! After the cold front we are experiencing, a fast and warm dinner hit the spot. Thanks for the great (and fast!) recipe! These were so good! But they needed WAY more greek yogurt than 1/2 cup. I don’t know if it was because the chicken seemed to soak it all up, or because I grossly underestimated the amount of chicken I had, but I bet I used a whole cup. I also added sliced grape tomatoes, peperoncinis, and red onions. Then we put thinly sliced cucumbers on top before wrapping it all up. So delicious! Also good on sandwich thins, pitas (obviously), and Boudin’s sourdough asiago crisps. AND this can be a great Weight Watchers Simple Start recipe, especially if you use fat free feta and omit the olives. And AND I love the idea of adding artichoke hearts, especially if marinated! Greek food has my whole heart. Love your site! I probably make something from it once a week! Thanks for all you do!!!! I had to double the yogurt and lemon juice myself and it was still a tad dry. I think I’d add red onions and possibly grape tomatoes as well for the next time. There was enough for about 8 wraps with the amount this recipe made (adjusted with more yogurt, lemon juice & pepper to offset the dryness). These were awesome! Just what I needed for our busy fall schedule. Made these tonight but substituted ground turkey. Kind of like a Mediterranean taco. They were AMAZING!!!!! Thank you for this super yummy recipe! I made these for my kids lunches today. I think the salty feta and kalamata olives were salt enough. They were a touch too salty so I will not add the additional 1/4 tsp. salt next time. I also added a touch of Greek herbs for a little dash of flavor. They were a tasty change. I’ll make again. oops, I meant 1/2 tsp. salt. I would leave that out in the future. I’m scared when that day comes in my household…. love the 15 minute meal ideas to help extracurricular activity nights! We have 5 kids and know well the schedule of craziness that you are talking about. I also try like crazy to get healthy meals into my family, all while driving or hanging out at the park. 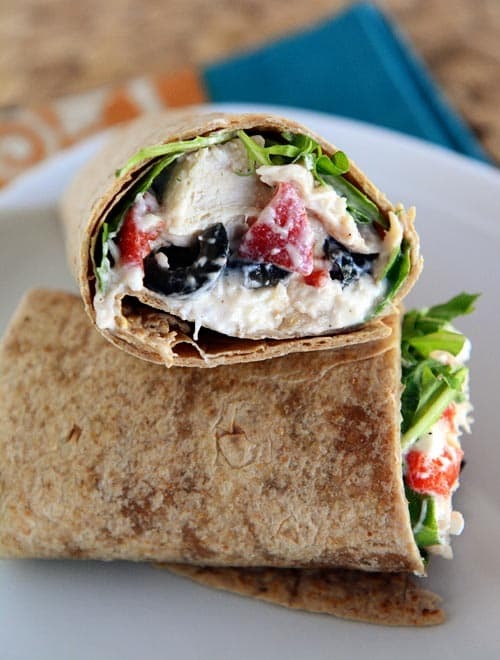 We do a lot of healthy pasta salads, but I am SO excited to try these yummy looking wraps! Anymore healthy, transportable meals you can recommend would be greatly appreciated! This looks so yummy! where do you buy your wraps at? They look big and fancy, not your average grocery store tortilla. Jessica DuRee – I generally buy them at Sam’s Club/Costco but sometimes the grocery store(s) will have the large wraps in different flavors. This was great! We used arugula and whole wheat wraps and added thin slices of fresh organic nectarine right before wrapping it up– delicious! For those with smaller families who won’t use this all up at one time, I suggest that you squeeze the fresh lemon juice just on the portion you are eating right before wrapping it up so that the chicken in the left-over portion isn’t broken down by the acid. Thank you Mel for a good, fast recipe for a busy night…and, for our smaller family, leftovers for lunch tomorrow! I tossed in a little fresh basil (on the counter waiting to be transformed into glorious pesto) and put some thin-sliced cucumber on with the spinach. A-ma-zing! Made these tonight for our dinner swap. Perfect timing. Thanks Mel! Michelle B. – I usually use THIS method for my shredded chicken. Thank you!!! I love your website and all of your recipes!! I’m in a similar boat! Four kids on four different soccer teams! Its so exhausting. Last year my kids complained about how busy we were so I said we could totally cut this in half and have two of you play now and two play in the spring. “So which two don’t want to play soccer right now?”…you could hear the crickets outside, total slience. I greatly appreciate the quick meal ideas!! Try and master that crazy schedule now while they are younger. It only gets harder as they get older! Good luck! I make a wrap very similar to this but instead of greek yogurt I use hummus, artichoke hearts and toss my greens in a vinaigrette. I also splurge for the special spinach and sun-dried tomato basil wraps! I have to try it with the greek yogurt! I have lived that schedule exactly, but I don’t think I ever delivered anything quite so delicious looking to the actual fields! We live in Blaine, MN, home to the National Sports Center and the largest soccer complex in the world. I was so grateful when I had three kiddos on three different teams (and my husband traveled a lot) that all of our practices and games were in the same general area. I never had to look at a map (except for the field map) to figure out where to go. Kudos to you for jumping in – enjoy the learning curve and the adventure! Only our youngest still plays (the others are too old now for the rec. league) and we have many happy memories at those fields! Oh Mel, what memories you just brought back! Our boys played football, but for years I always had garbage bags in the car. Either to use to sit on if the bleachers were wet, or to wear in a downpour, (cute I know), or to haul home the sweaty, muddy gear. Good times! Also, I am an underscheduler too, and could stay at home most days. I only let my kids do one sport and I teach them piano, but seriously by the time they all do one sport and have piano lessons and Scouts, it’s crazy! Man, your description of your schedule is so close to mine! I feel the EXACT same way about dinner! It is so important to me to get a good dinner on the table at least most nights that after school activities drive me crazy! Plus I teach piano lessons 2 days a week so those nights I either have to have leftovers or a quick or make-ahead meal option. It’s a struggle! Now that we have soccer 3 nights a week, I changed my piano schedule so I would have one more night to cook a good meal. I’m glad I’m not the only one that feels this way! I think everyone thinks I’m weird to be so concerned about making dinner and how it will fit into a busy schedule! Hang in there with the busy soccer season. I too, tend to under-schedule my boys. They can do two sports per year – no club teams – only rec. They generally choose basketball and baseball. Add in piano lessons and church stuff and that’s more than enough! Love the idea of this recipe! We like capers at our house so may do those instead of olives but either route sounds delicious. Thanks for another wonderful recipe Mel! These sound amazing Mel – I love the Mediterranean flavours! I had to laugh when I read your post– last night dinner at the field was BBQ chicken on buns with watermelon. Gotta do what ya can to have dinner together! 🙂 Thanks for the yummy recipes, this one looks great for busy nights! We have soccer also 2 nights a week and one of those nights has another activity. I have organized my meal plan to accommodate the craziness of soccer practice in the middle of a normal meal time and the one totally not home until bed time with some on the go meals. This wrap sounds absolutely wonderful. I have almost all of the ingredients now. I think it is going to make the roster for tonight’s soccer practice. Thanks for the timely recipe idea. Now if I can pull off getting the Brookies made for a special chocolate after the practice treat, life would be so good! I am the same way! Even though soccer/volleyball is only 6 weeks, I dread it every year. I am really hoping my kids don’t ask to play on a competitive team!! I feel your pain, Mel! Except I only had one child playing soccer. I can’t begin to imagine you with three children playing! 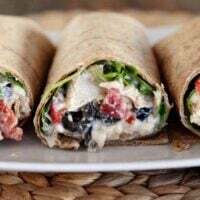 😉 These wraps look so delicious, and perfect for a meal on the soccer field or a picnic! Wishing you a non-crazy, fun Fall soccer season! I only have one doing soccer right now but Monday’s is a dinner-on-the-go or on the field type of night. I will try this wraps since it is much healthier than pizza on the go. I do too like to keep things simple regarding activities but even one or two things going on make for a busy schedule! I look forward to more soccer night meals! Love your blog. These look delicious. My family does not like olives though. Would it feel like these were missing something if I just left the olives out or do you have any ideas for what I could replace them with? Thanks. Hi Sheli – you could leave them out although they really help balance the flavor and texture of the wraps. You could try capers (that was suggested in the original recipe although we don’t love them in our house) or maybe just another type of chopped vegetable like marinated artichoke hearts or mushrooms? Soccer practice does seem to complicate dinner!! I love your blog and hope you keep posting more ideas of things to eat on the road / at the soccer field. Many moms need help during this time of the year!! You’ve got this! I do wonder if they are starving again after practice? Mine were and it made me crazy to try to feed them more because there usually weren’t any leftovers. You always speak my language … Totally my life right now … 3 boys on 3 different teams … Monday-Thursday …. And the under scheduling/hermit tendencies … Yep, me too!!! If it weren’t for this here blog we’d never survive soccer season … Any season for that matter … Love You Mel !!! Can’t wait to add these to the list of other amazing wraps you have here! Oh man, you sound busy! And I’m so proud that you still get dinner on the table. I hope to be half as cool as you one day!